THE UNION environment ministry has given in-principle clearance to a proposed hydro-project on the Alaknanda river, a tributary of the Ganga, in Uttarakhand. The 300 MW project had been rejected twice by the statutory body which recommends forest clearances, the forest advisory committee (FAC). FAC says the project lies in the buffer zone of Nanda Devi Biosphere Reserve (NDBR), a home to many endangered species. The project includes an 18-metre-high diversion barrage which would be constructed across the river, 3 km downstream of Badrinath town in Chamoli district. It will have a 2.87 km long tunnel and an underground power house near the Khirao Ganga. For the project, developer GMR had sought forest clearance for 60 hectares. While reviewing the project in May last year, FAC observed it is located in the buffer zone of the reserve, which houses the Nanda Devi National Park and the Valley of Flowers—two core zones also inscribed as UNESCO’s World Heritage Sites. Its decision was based on an interim report of a 2011 study by Dehradun-based Wildlife Institute of India (WII). The study was commissioned by the environment ministry, which asked WII to assess the cumulative impacts of hydro projects in the Alaknanda-Bhagirathi basin. It focused on five projects, including GMR’s. In its report, WII stated the Alaknanda project should not be given clearance as it will seriously hamper the movement of snow leopards, brown bears and other species. Four months later, GMR resubmitted the proposal. FAC again rejected it, saying the company did not submit any new facts. However, the ministry’s forest division overlooked FAC’s recommendation and cleared the project on November 8. When Union Minister of State for Environment and Forests (independent charge) Jayanthi Natarajan was asked about the clearance, she said the final approval is pending with her ministry. “When the matter comes for final clearance I will take a decision on merits and in the best interests of the environment and the country,” she said. 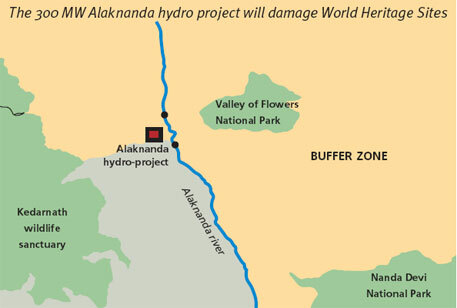 The WII report says construction of the proposed Alaknanda hydro-electric project is likely to cause severe fragmentation and degradation of wildlife habitats. As the brown bear has its eastern most distribution limits in this area, the proposed hydro-electric and other developmental activities will lead to habitat loss. Cumulative impacts of the developmental activities will affect outstanding universal values of the World Heritage Sites. The conservation status of the core zones in NDBR has been evaluated as excellent, the report adds. Environment and water expert Himanshu Thakkar says the forest clearance does not even acknowledge the highest conservation value that WII accords to the affected area. We were reading the content of your article. Before making such interpretation we would like you to actually understand the WII report from depth and see the result only after critically reviewing the validity of methods followed before making the result as basis for any argument. Environment is not excluding Human being, and thus need to incorporate human too in the analysis. We have critically reviewed both the report of WII and found that the report cannot be used for any decision making as there is hardly any scientific basis which supports the conclusion of the reports. As source of water, Himalayan Rivers, especially Ganga have been crucial for many human settlements from its origin up to confluence with sea. The stretch of Ganga beyond Rishikesh is fulfilling the demands of many industries including irrigation and transport. Economic activities including its use as natural sewers have placed a heavy burden on this river. But in the last twenty years, initiatives to clean up Ganga river and reduce the amount of industrial waste and sewage being discharged into rivers have not yielded desired results. As part of the IndiaÃ”Ã‡Ã–s River conservation policy framework Ganga river is kept in topmost priority and government has set an ambitious target of achieving good ecological status for the river. While significant progress towards this goal has already been made in terms of sewage and industrial waste treatment plants being constructed all along river stretch, much more work remains to be done for enhancing the ecological status of river Ganga. To achieve this goal govt started intervening in the developmental projects like Hydropower on the insistence of certain people/ organizations. A very recent example of this is the Ã”Ã‡Â£cumulative environmental impact assessment (CEIA)Ã”Ã‡Ã˜ study awarded by MOEF, Govt. of India to Indian Institute of Technology (IIT), Roorkee and Wildlife Institute of India (WII), Dehradun. Quick and unscientific approach to address the issues of interest in CEIA by a reputed institute like WII has already started misleading the decision makers and impacting development of the Hydropower in the state of Uttarakhand. This not only is dangerous for the state but are likely to impact the overall development of the country in future. The Interim report of WII, which was full of mistakes and made with extreme insincerity and very little scientific basis, was made a basis for decision by MOEF to stop three major projects and permit two others. Final report of WII changed the entire approach of evaluation and is totally different from interim report. In fact the final report hides the mistakes that were made in the interim report. There is no transparency in the final report and is again full of misleading information and mistakes. Recommendation for reconsideration of projects is biased and misleading. The team members of the study did not have any experience on working with hydropower designs and neither made any effort to understand the designs of various projects before actually studying the impact of these projects. We have been involved in studying the environmental impact of hydropower for the last one decade and tried to understand the design of a project vis-a-vis their impact on the environment. Realizing the importance of hydropower development in the region and also the maintenance of ecology of the River, we have evaluated both the interim and final CEIA report made by WII. The findings of the review are so shocking that we feel this report cannot be used for even refereeing any facts or make any policy decision. Such misleading reports may further strengthen vested interest of certain agencies (NGOÃ”Ã‡Ã–s/individuals) who are already active in stalling the total Hydro Power Development of the State. People's Government - Peoples Policies!